Pete here, can you upload a sheet shot or share with http://tinygrab.com/ or something simular. Thanks Denis. http://grab.by/xv6w I think I've done it right !!! So you added an account category in the chart of accounts and now you can't see it in Money Out > Bill Expense? Can you give me the email your account is setup under and the name of the account you created please and we'll look into it for you. That grant account is added by default when you setup Bullet it is not meant to be visible as a category for Bills. 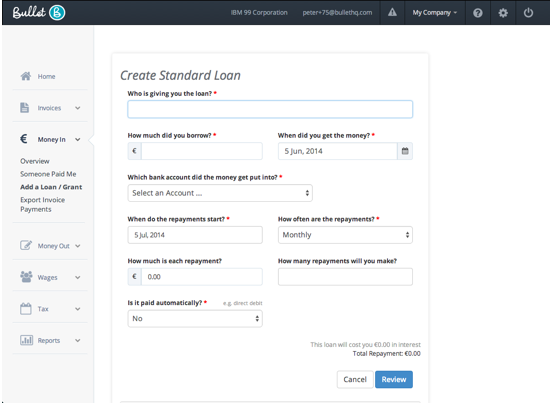 We created a loans workflow to handle grants, if you follow that you’ll see a payments option in there. 43Hi, I think I might have cancelled my query with you there. Just wondering can I bring up a full debtors list of what customers have not made payments by the due date? And if so, can I print it off? Thanks120Sales reconciliation58Registration error38Hi Guys,I have entered a receipt with picture and now I want to enter another receipt but i see the screen– snap, upload, bin receipts9i put a credit note through 3 times to make sure i had saved it and done it correctly against an overpayment recorded to a supplier.At no stage on the 3 entries has this credit note appeared against thesuppliers bill.In other words it seems when you create a credit note and record the refund to your account there is no evidence shown on the supplier statement that it has happened.